The marathon start and the first six miles were absolutely magical with the pre-dawn campfires, full moon, and then the sunrise giving way to a beautiful desert scape! 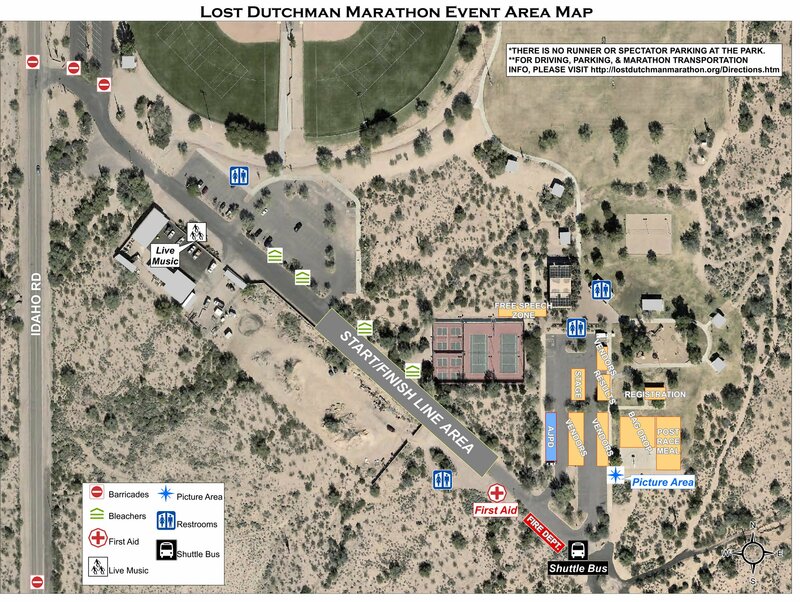 Beginning near Gold Canyon, AZ (30 miles east of Phoenix), the marathon is a scenic, rolling, point-to-point, USATF certified course (#AZ10016TLB) that can be used as a qualifier for the Boston Marathon. Although this is a challenging course, every year a significant number of finishers run Boston-qualifying times. We also receive letters from experienced marathoners who PR on this course. All runners will receive free transportation from the Rodeo Grounds to the start. 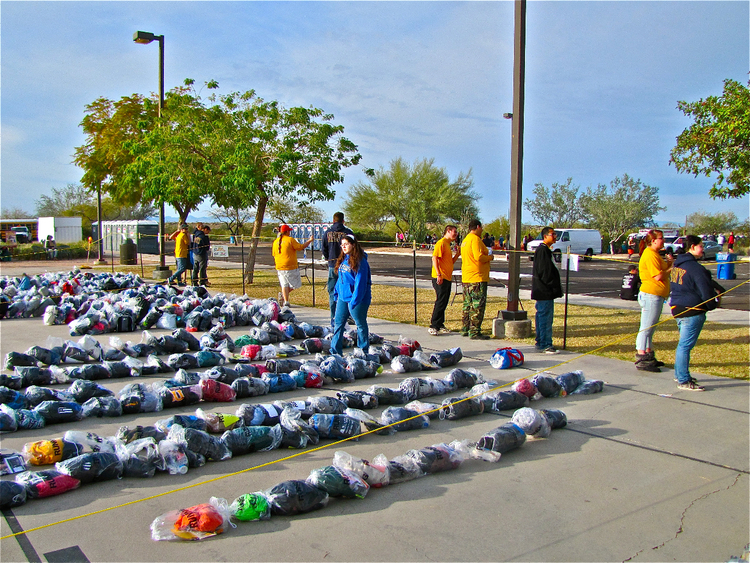 A clothing drop bag location will be at the marathon start, and runners will receive their clothes after the finish of the race. The race start elevation is at 2330 feet above sea level. The elevation at the finish is 1840 feet. Every mile split will be marked. 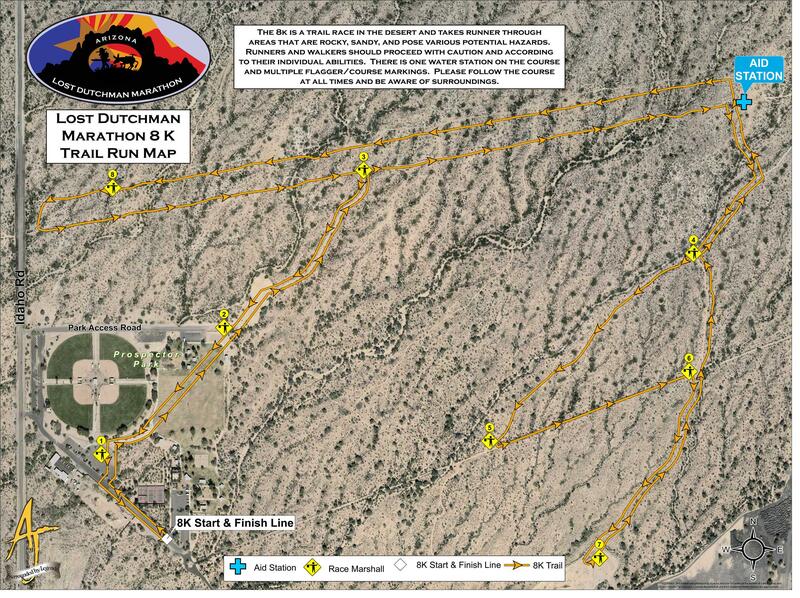 The marathon starts a half mile south of the Peralta Trailhead on Peralta Road. The first six miles are on a well-maintained, unpaved road through beautiful desert vistas. The seventh mile of Peralta Road is a newly paved four-lane boulevard. The course transitions to US 60 for 1.5 miles and then turns north on Kings Ranch Road for a tour of the beautiful and historic Kings Ranch and Gold Canyon area. There are rolling hills in this area, but the focus is on the majestic view of the famous Superstition Mountains immediately to the north that rise straight up from an elevation of 2000’ to 5000’. 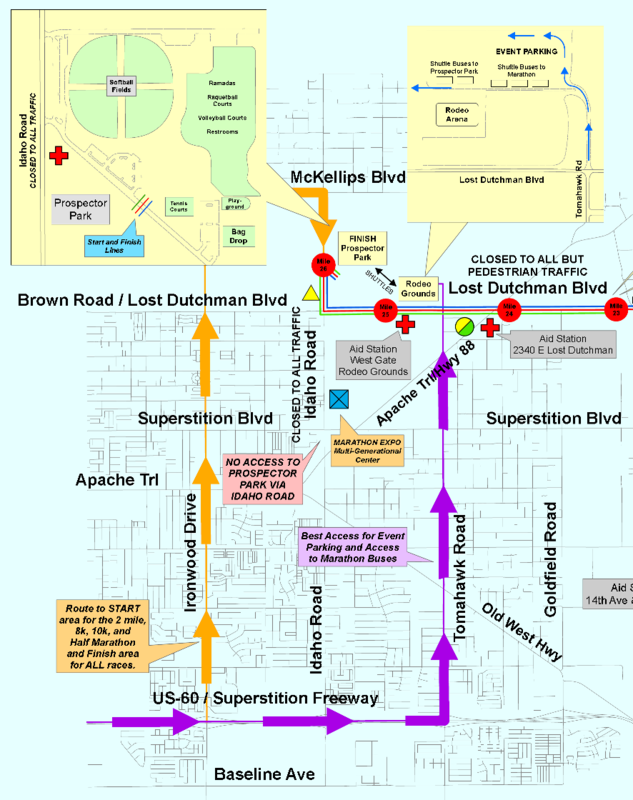 The course returns to US 60 at approximately the 15 mile mark and follows US 60 for another 1.5 miles to Mountain View Road. 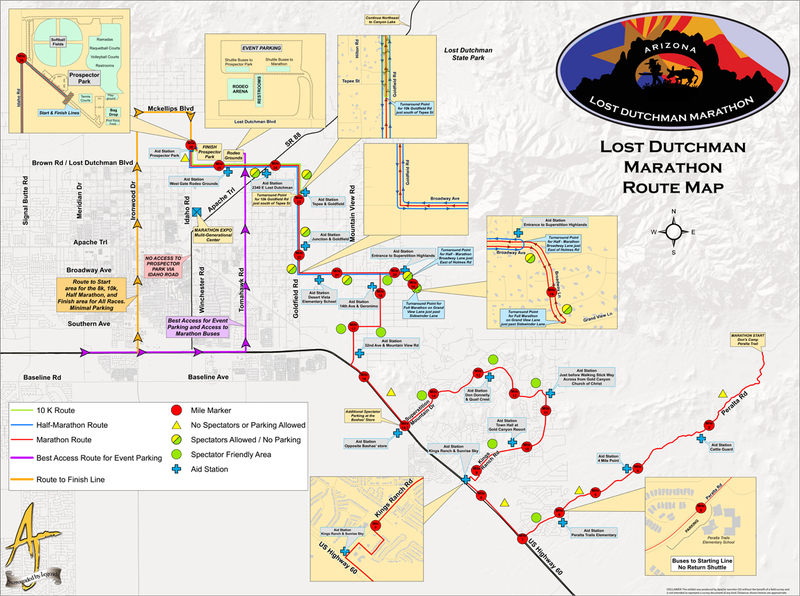 The course departs Mountain View and moves at a gradual incline toward the base of Superstition Mountain where you will find a turnaround at about 19.4 miles; from that point the elevation again drops toward the finish line. Shortly after the turnaround you will be running with half marathoners. It adds to the fun to see how many half marathoners you can pick off before crossing the finish line. Just past mile 23 you will pass through a wall which is a great photo op with beautiful Superstition Mountain in the background. Save a little energy for the last 2 tenths as you run past the on lookers to the finish line. View the marathon course here. There are aid stations every 2 miles on the marathon course for the first 20 miles and then an aid station every mile to the finish. There are port-a-jons near every aid station. Lemon Lime Gatorade will be available at every other aid station starting at marathon mile 4. GU Energy Gel will be at miles 10 and 18 on the marathon course only. Bananas will be at 2 aid stations. Aid stations are staffed by our tremendous volunteers without whom our event could not happen. Please thank them along the way. There will be clothing bag drop zone in Prospector Park for the convenience of the runners not wishing to return to their cars.